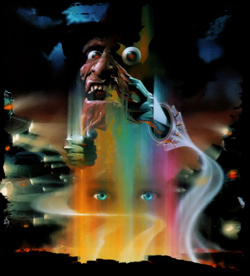 Freddy Krueger hunts the last of the Elm Street Children and ends up facing his dream counterpart in A Nightmare on Elm Street 4: The Dream Master. Two scripts are available here: the draft for the film’s FX team and the draft New Line Home Video included on the DVD released in 2000. The script for the FX team is a website exclusive! Both scripts are in PDF format. 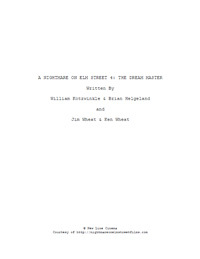 A Nightmare on Elm Street 3: Dream Warriors proved a box office smash and New Line Cinema moved quickly to push a fourth film into production. As with Nightmare 3, New Line again approached original Nightmare creator Wes Craven to participate. “Initially, I approached Wes about a fourth film,” explained producer Sara Risher. “His idea was illogical. It was about time travel within dreams that broke all the rules of dreams. 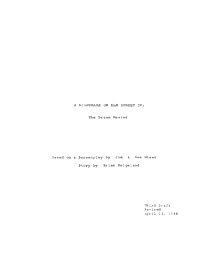 After the production dust settled, final screenwriting credits were given to William Kotzwinkle, Brian Helgeland, Jim Wheat, and Ken Wheat. Are you having trouble viewing any of the scripts on this page? Then click here. Kristen glances up at the sky. Rain trickles onto her face. Then after a second, she looks back down at the sidewalk. THE LITTLE GIRL IS GONE. Kristen scans the area, but the child is nowhere to be seen. Rain is splashing down on the chalk illustration. Not only is the image washing away, but as the colors blend together, they form a liquid that looks just like BLOOD. Kristen hears a CREAKING NOISE coming from the direction of the house. She turns and stares at the menacing structure. The front door is SLOWLY OPENING. Somehow Kristen seems unsurprised by this. And as though drawn by an uncontrollable urge, she turns toward the house. With thunder and lightning crashing above her, she walks deliberately toward the open door. As soon as Kristen enters the house, she hears VOICES behind her. It’s CHILDREN SINGING a strange nursery rhyme. Alice is staring at the house. She suddenly speaks, almost to herself. Kristen glances over at Alice who notices Kristen’s attention. The dream master. I think I remember the rhyme. Sorry, I forgot the rest. It’s okay. It’s only a prayer, no good in Freddy’s realm. Alice sinks heavy among the debris. She doesn’t move. Freddy advances on her. Going in for the kill. Just when he’s close enough, Alice springs up. She was playing possum. She reaches out and PUNCHES a hole in the wall behind the debris of the confessional. She pulls out several crackling electric cables. She looks bizarre and powerful framed for a moment in the blue light of the sparkling electricity. She rips off the gadget from around her neck and aims it at Freddy. Freddy LAUGHS at her and it. Alice shoves one of the electric cables into the center of the gadget. It HUMS and BUILDS and GLOWS until a LOUD, incredibly powerful LASER BOLT shoots out of it and hits Freddy square in the chest. A stunned Freddy looks at his mid-section. Quite frankly, it’s missing. There’s only a gaping, smoking hole through which Alice can see the rest of the church.